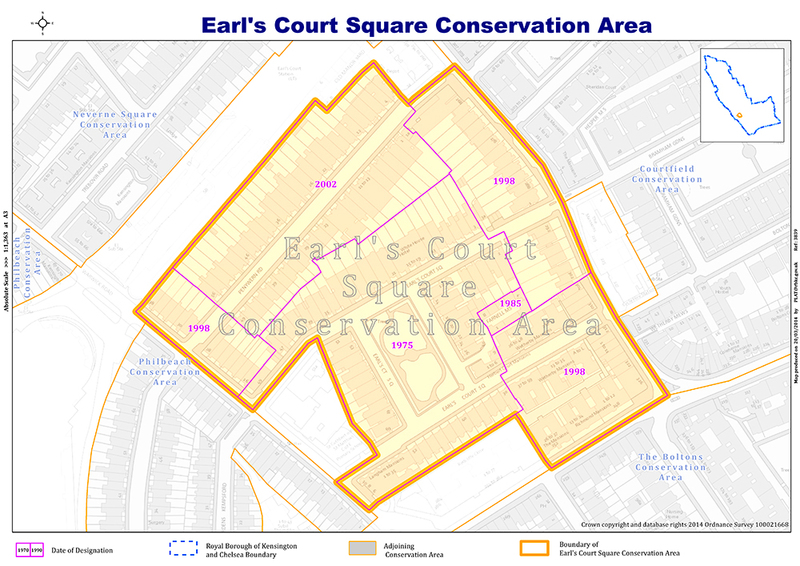 Earl’s Court Square lies between the southern end of Earl’s Court Road and Warwick Road within the Royal Borough of Kensington and Chelsea. It became a Conservation area in 1975. Most of the properties are late Victorian white stucco fronted houses. The southern terrace is of Grade II listed ‘Dutch’ style houses and there are three distinct mansion blocks, Herbert Court, Langham and Wetherby. The entrance to St Cuthbert’s with St Matthias School, as well as that of the St Cuthbert’s Family Centre, is in the south west arm. The latter is where voting in local and national elections takes place. Vehicular access is from the south west arm by Langham Mansions, with two exits, one into Earl’s Court Road and one into Warwick Road. The southern terrace is one way eastbound with the south east arm, bounded by the various Wetherby Mansions, being a cul-de-sac.